The Reference Policy is now the standard policy source used to build GNU/Linux SELinux policies. This provides a single source tree with supporting documentation that can be used to build policies for different purposes such as: confining important daemons, supporting MLS / MCS type policies and locking down systems so that all processes are under SELinux control. Constructed and types of policy builds supported. Adding new modules to the build. Installation as a full Reference Policy source or as Header files. Impact of the migration process being used to convert compiled module files (*.pp) to CIL. Modifying the configuration files to build new policies. Where the <NAME> entry is taken from the build.conf file as discussed in the Reference Policy Build Options - build.conf section. The Installing and Building the Reference Policy Source section explains a simple build plus information on building the Fedora source. Loadable Module Policy - A policy that has a base module for core services and has the ability to load / unload modules to support applications as required. This is now the standard used by GNU / Linux distributions. Monolithic Policy - A policy that has all the required policy information in a single base policy and does not require the services of the module infrastructure (semanage(8) or semodule(8)). These are more suitable for embedded or minimal systems. 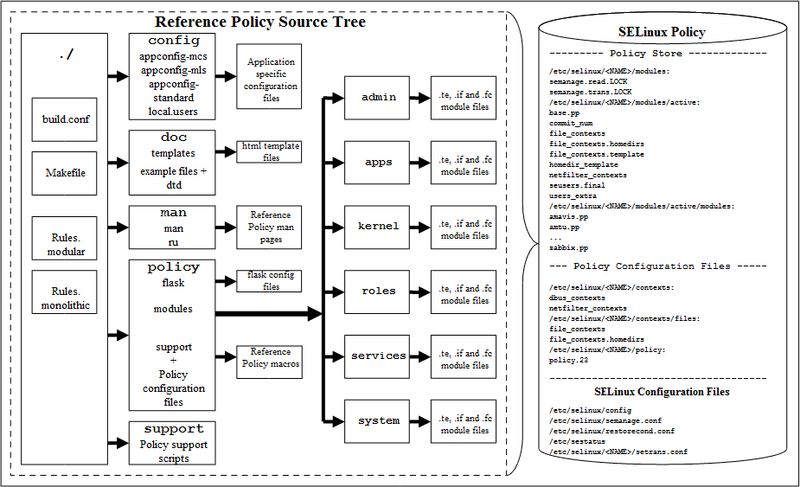 Each of the policy types are built using module files that define the specific rules required by the policy as detailed in the Reference Policy Module Files section. Note that the monolithic policy is built using the the same module files by forming a single 'base' source file. The Reference Policy relies heavily on the m4(1) macro processor as the majority of supporting services are m4 macros. As source code that is then used to build policies. This is not the general way policies are distributed as it contains the complete source that most administrators do not need. The Reference Policy Source section describes the source and the Installing and Building the Reference Policy Source section describes how to install the source and build a policy. As 'Policy Headers'. This is the most common way to distribute the Reference Policy. Basically, the modules that make up 'the distribution' are pre-built and then linked to form a base and optional modules. The 'headers' that make-up the policy are then distributed along with makefiles and documentation. A policy writer can then build policy using the core modules supported by the distribution, and using development tools they can add their own policy modules. The Reference Policy Headers section describes how these are installed and used to build modules. These three rpms contain policy configuration files and the packaged policy modules (*.pp). They will be used to form the particular policy type in /usr/share/selinux/<NAME>, the install process will then install the policy in the appropriate /etc/selinux/<NAME> directory. Normally only one policy would be installed and active, however for development purposes all can be installed. Contains the sandbox module for use by the policycoreutils-sandbox package. This will be installed as a module for one of the three main policies described above. minimum - MCS policy that supports a minimal set of confined daemons within their own domains. The remainder run in the unconfined_t space. targeted - MCS policy that supports a greater number of confined daemons and can also confine other areas and users (this also supports the older 'strict' policy). mls - MLS policy for server based systems. one to state that the ada_t process has permission to write to the stack and memory allocated to a file. one that states that if the unconfined module is loaded, then allow the ada_t domain unconfined access. Note that if the flow of this statement is followed it will be seen that many more interfaces and macros are called to build the final raw SELinux language statements. An expanded module source is shown in the Module Expansion Process section. An external interface file that defines the services available to other modules. These files are named <module_name>.if. ada_domtrans - that allows another module (running in domain $1) to run the ada application in the ada_t domain. ada_run - that allows another module to run the ada application in the ada_t domain (via the ada_domtrans interface), then associate the ada_t domain to the caller defined role ($2) and terminal ($3). Provided of course the caller domain has permission. Access Interfaces - These are the most common and define interfaces that .te modules can call as described in the ada examples. They are generated by the interface macro as detailed in the the interface Macro section. Template Interfaces - These are required whenever a module is required in different domains and allows the type(s) to be redefined by adding a prefix supplied by the calling module. The basic idea is to set up an application in a domain that is suitable for the defined SELinux user and role to access but not others. These are generated by the template macro as detailed in the template Macro section that also explains the openoffice.if template. A file labeling file that defines the labels to be added to files for the specified module. These files are named <module_name>.fc. The build process will amalgamate all the .fc files and finally form the file_contexts file that will be used to label the filesystem. For example the ada.fc file shown below requires that the specified files are all labeled system_u:object_r:ada_exec_t:s0. The <module_name> must be unique within the reference policy source tree and should reflect the specific GNU / Linux service being enforced by the policy. Policy language statements as defined in the Kernel Policy Language section. Reference Policy macros that are defined in the Reference Policy Macros section. External interface calls defined within other modules (.te and .if only). ##Execute the ada program in the ada domain. ##allow the specified role the ada domain. One of the advantages of the reference policy is that it is possible to automatically generate documentation as a part of the build process. This documentation is defined in XML and generated as HTML files suitable for viewing via a browser. The documentation for Fedora can be viewed in a browser by [file:///usr/share/doc/selinux-policy/html/index.html] once the selinux-policy-doc rpm has been installed. The documentation for the Reference Policy source will be available at <location>/src/policy/doc/html once make html has been executed (the <location> is the location of the installed source after make install-src has been executed as described in the Installing and Building the Reference Policy Source section). The Reference Policy documentation may also be available at a default location of /usr/share/doc/refpolicy-VERSION/html if make install-doc has been executed (where VERSION is the entry from the source VERSION file. The Documentation Screenshot shows an example produced for the ada module interfaces. This section explains the source layout and configuration files, with the actual installation and building covered in the Installing and Building the Reference Policy Source section. Reference Policy Files and Directories - Describes the files and their location. Source Configuration Files - Details the contents of the build.conf and modules.conf configuration files. Source Installation and Build Make Options - Describes the make targets. Modular Policy Build Structure - Describes how the various source files are linked together to form a base policy module (base.conf) during the build process. The Installing and Building the Reference Policy Source section then describes how the initial source is installed and configured to allow a policy to be built. Table 1 shows the major files and their directories with a description of each taken from the README file. All directories are relative to the root of the Reference Policy source directory ./policy. Two of these configuration files (build.conf and modules.conf) are further detailed in the Source Configuration Files section as they define how the policy will be built. During the build process, a file is generated in the ./policy directory called either policy.conf or base.conf depending whether a monolithic or modular policy is being built. This file is explained in the Modular Policy Build Structure section. Makefile General rules for building the policy. Rules.modular Makefile rules specific to building loadable module policies. Rules.monolithic Makefile rules specific to building monolithic policies. build.conf Options which influence the building of the policy, such as the policy type and distribution. This file is described in the Reference Policy Build Options - build.conf section. config/appconfig-<type> Application configuration files for all configurations of the Reference Policy where <type> is taken from the build.conf TYPE entry that are currently: standard, MLS and MCS). These files are used by SELinux-aware programs and described in the SELinux Configuration Files section. config/file_contexts.subs_dist outline contexts/files/file_contexts.subs and file_contexts.subs_dist File] section). config/local.users The file read by load policy for adding SELinux users to the policy on the fly. Note that this file is not used in the modular policy build. doc/html/* When make html has been executed, contains the in-policy XML documentation, presented in web page form . doc/policy.dtd The doc/policy.xml file is validated against this DTD. doc/policy.xml This file is generated/updated by the conf and html make targets. It contains the complete XML documentation included in the policy. doc/templates/* Templates used for documentation web pages. support/* Tools used in the build process. policy/flask/initial_sids This file has declarations for each initial SID. The file usage in policy generation is described in the Modular Policy Build Structure section. policy/flask/security_classes This file has declarations for each security class. policy/flask/access_vectors This file defines the common permissions and class specific permissions. The file is described in the Modular Policy Build Structure section. policy/modules/* Each directory represents a layer in Reference Policy. All of the modules are contained in one of these layers. The contrib modules are supplied externally to the Reference Policy, then linked into the build. metadata.xml - describes the layer. <module_name>.te, .if & .fc - contains policy source as described in the Reference Policy Module Files section. policy/support/* Reference Policy support macros. These are described in the Reference Policy Macros section. policy/booleans.conf This file is generated/updated by the conf make target. It contains the booleans in the policy, and their default values. If tunables are implemented as booleans, tunables will also be included. This file will be installed as the /etc/selinux/NAME/booleans file (note that this is not true for any system that implements the modular policy - see the Booleans, Global Booleans and Tunable Booleans section). policy/constraints This file defines constraints on permissions in the form of boolean expressions that must be satisfied in order for specified permissions to be granted. These constraints are used to further refine the type enforcement rules and the role allow rules. Typically, these constraints are used to restrict changes in user identity or role to certain domains. (Note that this file does not contain the MLS / MCS constraints as they are in the mls and mcs files described below). policy/context_defaults This would contain any specific default_user, default_role, default_type and/or default_range rules required by the policy. policy/global_booleans This file defines all booleans that have a global scope, their default value, and documentation. See the Booleans, Global Booleans and Tunable Booleans section. policy/global_tunables This file defines all tunables that have a global scope, their default value, and documentation. See the Booleans, Global Booleans and Tunable Booleans section. policy/mcs This contains information used to generate the sensitivity, category, level and mlsconstraint statements used to define the MCS configuration. policy/mls This contains information used to generate the sensitivity, category, level and mlsconstraint statements used to define the MLS configuration. policy/modules.conf This file contains a listing of available modules, and how they will be used when building Reference Policy. To prevent a module from being used, set the module to "off". For monolithic policies, modules set to "base" and "module" will be included in the policy. For modular policies, modules set to "base" will be included in the base module; those set to "module" will be compiled as individual loadable modules. This file is described in the Reference Policy Build Options - modules.conf section. policy/policy_capabilities This file defines the policy capabilities that can be enabled in the policy. policy/users This file defines the users included in the policy. securetty_types These files are not part of the standard Reference Policy distribution but are added by Fedora source updates. There are two major configuration files (build.conf and modules.conf) that define the policy to be built and are detailed in this section. This file defines the policy type to be built that will influence its name and where the source will be located once it is finally installed. An example file content is shown in the Installing and Building the Reference Policy Source section where it is used to install and then build the policy. Table 2 explains the fields that can be defined within this file, however there are a number of m4 macro parameters that are set up when this file is read by the build process makefiles. These macro definitions are shown in Table 20 and are also used within the module source files to control how the policy is built with examples shown in the ifdef / ifndef Parameters section. OUTPUT_POLICY Integer Set the version of the policy created when building a monolithic policy. This option has no effect on modular policy. TYPE String Available options are standard (uses RBAC/TE), mcs (uses RBAC/TE/MCS) and mls (uses RBAC/TE/MLS). The mls and mcs options control the enable_mls, and enable_mcs policy blocks. NAME String Sets the name of the policy; the NAME is used when installing files to e.g., /etc/selinux/NAME and /usr/share/selinux/NAME. If not set, the policy type field (TYPE) is used. DISTRO String (optional) Enable distribution-specific policy. Available options are redhat, rhel4, gentoo, debian, and suse. This option controls distro_redhat, distro_rhel4, distro_suse policy blocks. UNK_PERMS String Set the kernel behaviour for handling of permissions defined in the kernel but missing from the policy. The permissions can either be allowed, denied, or the policy loading can be rejected. See the SELinux Filesystem section for more details. If not set, then it will be taken from the semanage.conf file. DIRECT_INITRC n) If 'y' sysadm will be allowed to directly run init scripts, instead of requiring the run_init tool. This is a build option instead of a tunable since role transitions do not work in conditional policy. This option controls direct_sysadm_daemon policy blocks. MONOLITHIC n) If 'y' a monolithic policy is built, otherwise a modular policy is built. UBAC n) If 'y' User Based Access Control policy is built. The default for Red Hat is 'n'. These are defined as constraints in the policy/constraints file. Note Version 1 of the Reference Policy did not have this entry and defaulted to Role Based Access Control. The UBAC option is described at http://blog.siphos.be/2011/05/selinux-user-based-access-control/. CUSTOM_BUILDOPT String Space separated list of custom build options. MLS_SENS Integer Set the number of sensitivities in the MLS policy. Ignored on standard and MCS policies. MLS_CATS Integer Set the number of categories in the MLS policy. Ignored on standard and MCS policies. MCS_CATS Integer Set the number of categories in the MCS policy. Ignored on standard and MLS policies. QUIET n) If 'y' the build system will only display status messages and error messages. This option has no effect on policy. Table 3: m4 parameters set at build time - These have been extracted from the Reference Policy Makefile file. enable_mls TYPE Set if MLS policy build enabled. enable_mcs TYPE Set if MCS policy build enabled. enable_ubac UBAC Set if UBAC set to 'y'. mls_num_sens MLS_SENS The number of MLS sensitivities configured. mls_num_cats MLS_CATS The number of MLS categories configured. mcs_num_cats MCS_CATS The number of MCS categories configured. distro_$(DISTRO) DISTRO The distro name or blank. direct_sysadm_daemon DIRECT_INITRC If DIRECT_INITRC entry set to 'y'. hide_broken_symtoms This is set up in the Makefile and can be used in modules to hide errors with dontaudit rules (or even allow rules). module_name The name of the module to be included within the build. base The module will be in the base module for a modular policy build (build.conf entry MONOLITHIC = n). module The module will be built as a loadable module for a modular policy build. If a monolithic policy is being built (build.conf entry MONOLITHIC = y), then this module will be built into the base module. off The module will not be included in any build. ##and unlabeled processes and objects. ##This module has initial SIDs. The modules.conf file will also reflect that a module is required in the base by adding a comment 'Required in base' when the make conf target is executed (as all the .if files are checked during this process and the modules.conf file updated). # Policy for kernel threads, proc filesystem,and unlabeled processes and objects. /bin, /sbin, /usr/bin, and /usr/sbin. The .fc file sets up the labels for these items. All the interface calls start with 'corecmd_'. kernel corenetwork Policy controlling access to network objects and also contains the initial SIDs for these. The .if file is large and automatically generated. All the interface calls start with 'corenet_'. kernel devices This module creates the device node concept and provides the policy for many of the device files. Notable exceptions are the mass storage and terminal devices that are covered by other modules (that is a char or block device file, usually in /dev). All types that are used to label device nodes should use the dev_node macro. the device directories containing device nodes. individual access to specific device nodes covered by this module. All the interface calls start with 'dev_'. kernel domain Contains the core policy for forming and managing domains. All the interface calls start with 'domain_'. The concept of different file types including basic files, mount points, tmp files, etc. Access to groups of files and all files. Types and interfaces for the basic filesystem layout (/, /etc, /tmp, /usr, etc.). Contains the file initial SID. All the interface calls start with 'files_'. kernel filesystem Contains the policy for filesystems and the initial SID. All the interface calls start with 'fs_'. kernel kernel Contains the policy for kernel threads, proc filesystem, and unlabeled processes and objects. This module has initial SIDs. All the interface calls start with 'kernel_'. kernel mcs Policy for Multicategory security. The .te file only contains attributes used in MCS policy. All the interface calls start with 'mcs_'. kernel mls Policy for Multilevel security. The .te file only contains attributes used in MLS policy. All the interface calls start with 'mls_'. kernel selinux Contains the policy for the kernel SELinux security interface (selinuxfs). All the interface calls start with 'selinux_'. kernel terminal Contains the policy for terminals. All the interface calls start with 'term_'. kernel ubac Disabled by Fedora but enabled on standard Ref Policy. system application Enabled by Fedora but not standard Ref Policy. Defines attributes and interfaces for all user apps. system setrans Enabled by Fedora but not standard Ref Policy. The file can be created by an editor, however it is generally built initially by make conf that will add any additional modules to the file. The file can then be edited to configure the required modules as base, module or off. As will be seen in the Installing and Building the Reference Policy Source section, the Red Hat reference policy source comes with a number of pre-configured files that are used to produce the required policy including multiple versions of the modules.conf file. This section explains the various make options available that have been taken from the README file. Table 5 describes the general make targets, Table 6 describes the modular policy make targets and Table 7 describes the monolithic policy make targets. install-src Install the policy sources into /etc/selinux/NAME/src/policy, where NAME is defined in the build.conf file. If it is not defined, then TYPE is used instead. If a build.conf does not have the information, then the Makefile will default to the current entry in the /etc/selinux/config file or default to refpolicy. A pre-existing source policy will be moved to /etc/selinux/NAME/src/policy.bak. conf Regenerate policy.xml, and update/create modules.conf and booleans.conf. This should be done after adding or removing modules, or after running the bare target. If the configuration files exist, their settings will be preserved. This must be run on policy sources that are checked out from the CVS repository before they can be used. Note that if make bare has been executed before this make target, or it is a first build, then the modules/kernel/corenetwork.? ?.in files will be used to generate the corenetwork.te and corenetwork.if module files. These *.in files may be edited to configure network ports etc. (see the # network_node examples entries). clean Delete all temporary files, compiled policies, and file_contexts. Configuration files are left intact. bare Do the clean make target and also delete configuration files, web page documentation, and policy.xml. html Regenerate policy.xml and create web page documentation in the doc/html directory. install-appconfig Installs the appropriate SELinux-aware configuration files. base Compile and package the base module. This is the default target for modular policies. modules Compile and package all Reference Policy modules configured to be built as loadable modules. MODULENAME.pp Compile and package the MODULENAME Reference Policy module. all Compile and package the base module and all Reference Policy modules configured to be built as loadable modules. install Compile, package, and install the base module and Reference Policy modules configured to be built as loadable modules. load Compile, package, and install the base module and Reference Policy modules configured to be built as loadable modules, then insert them into the module store. validate Validate if the configured modules can successfully link and expand. install-headers Install the policy headers into /usr/share/selinux/NAME. The headers are sufficient for building a policy module locally, without requiring the complete Reference Policy sources. The build.conf settings for this policy configuration should be set before using this target. install-docs Build and install the documentation and example module source with Makefile. The default location is /usr/share/doc/refpolicy-VERSION, where the version is the value in the VERSION file. policy Compile a policy locally for development and testing. This is the default target for monolithic policies. install Compile and install the policy and file contexts. load Compile and install the policy and file contexts, then load the policy. enableaudit Remove all dontaudit rules from policy.conf. checklabels Check the labels on the filesystem, and report when a file would be relabeled, but do not change its label. restorelabels Relabel the filesystem and report each file that is relabeled. booleans.conf This file is generated / updated by make conf, and contains all the booleans in the policy with their default values. If tunable and global booleans are implemented then these are also included. This file can also be delivered as a part of the Fedora reference policy source as shown in the Installing and Building the Reference Policy Source section. This is generally because other default values are used for booleans and not those defined within the modules themselves (i.e. distribution specific booleans). When the make install is executed, this file will be used to set the default values. Note that if booleans are updated locally the policy store will contain a booleans.local file. In SELinux enabled systems that support the policy store features (modular policies) this file is not installed as /etc/selinux/NAME/booleans. global_tunables These are booleans that have been defined in module files using the gen_tunable macro and added to the global_tunables file by make conf. The tunable_policy macros are defined in each module where policy statements or interface calls are required. They are booleans for managing specific areas of policy that are global in scope. An example is allow_execstack that will allow all processes running in unconfined_t to make their stacks executable. This section explains the way a modular policy is constructed, this does not really need to be known but is used to show the files used that can then be investigated if required. When make all or make load or make install are executed the build.conf and modules.conf files are used to define the policy name and what modules will be built in the base and those as individual loadable modules. Basically the source modules (.te, .if and .fc) and core flask files are rebuilt in the tmp directory where the reference policy macros in the source modules will be expanded to form actual policy language statements as described in the SELinux Policy Language Policy Language section. Layout 1 shows these temporary files that are used to form the base.conf file during policy generation. The base.conf file will consist of language statements taken from the module defined as base in the modules.conf file along with the constraints, users etc. that are required to build a complete policy. The individual loadable modules are built in much the same way as shown in Layout 2. Layout 1: Base Module Build - This shows the temporary build files used to build the base module 'base.conf' as a part of the 'make' process. Note that the modules marked as base in modules.conf are built here. The 'NAME' is that defined in the build.conf file. Layout 2: Module Build - This shows the module files and the temporary build files used to build each module as a part of the 'make' process (i.e. those modules marked as module in modules.conf). One objective of the reference policy is to separate the modules into different layers reflecting their 'service' (e.g. kernel, system, app etc.). While it can sometimes be difficult to determine where a particular module should reside, it does help separation, however because the way the build process works, each module must have a unique name. Create a new layer directory ./policy/modules/LAYERNAME that reflects the layer's purpose. This section will give a brief overview of how to build the Reference Policy for an MCS modular build that is similar (but not the same) as the Fedora targeted policy. The Fedora F-20 version of the targeted policy build is discussed but building without using the rpm spec file is more complex. This will run through a simple configuration process and build of a reference policy similar to the Fedora targeted policy. By convention the source is installed in a central location and then for each type of policy a copy of the source is installed at /etc/selinux/<NAME>/src/policy. # By default, checkpolicy will create the highest version policy it supports. # distribution. redhat, gentoo, debian, suse, and rhel4 are current options. # the policy loading can be rejected. # work in conditional policy. # Build monolithic policy. Putting y here will build a monolithic policy. # increasing numerical order with s0 being lowest. # Number of MLS Categories. # The categories will be c0 to c(MLC_CATS-1). # Set this to y to only display status messages during build. Run make install-src to install source at policy build location. Change to the /etc/selinux/<NAME>/src/policy directory where an unconfigured basic policy has been installed. Run make conf to build an initial policy/booleans.conf and policy/modules.conf files. For this simple configuration these files will not be edited. This process will also build the policy/modules/kernel/corenetwork.te / corenetwork.if files if not already present. These would be based on the contents of corenetwork.te.in and corenetwork.if.in configuration files (for this simple configuration these files will not be edited). Run make load to build the policy, add the modules to the store and install the binary kernel policy plus its supporting configuration files. Note that if policy stores have been migrated, the store will default to /var/lib/selinux/refpolicy-test, with the modules in active/modules/400/<module_name>, there will also be a CIL version of the module (see [#4.1.1.Policy Store Migration|outline Policy Store Migration] for details). The policy should now be built and can be checked using tools such as apol(8) or loaded by editing the /etc/selinux/config file, running 'touch /.autorelabel' and rebooting the system. Building Fedora policies by hand is complex as they use the rpmbuild/SPECS/selinux-policy.spec file, therefore this section will give an overview of how this can be achieved, the reader can then experiment (the spec file gives an insight). The build process assumes that an equivelent 'targeted' policy will be built named 'targeted-179'. policy-f20-base.patch Fedora changes to Reference Policy version 2.20120725.
policy-f20-contrib.patch Fedora changes to Reference Policy contribution modules. Once the above has been completed, run make conf from ./serefpolicy-3.12.1 to initialise the build (it creates two important files in ./serefpolicy-3.12.1/policy/modules/kernel called corenetwork.te and corenetwork.if). config.tgz Fedora changes to Reference Policy version 2.20120725 application config files. These should be unpacked to update the ./serefpolicy-3.12.1/config versions (some will be added and others updated). permissivedomains.pp Contains Fedora domains currently sets to permissive. In selinux-policy-3.12.1-179.fc20 there are 31 permissive domains. Copy this to ./serefpolicy-3.12.1 as it will then be built into the policy. selinux-policy.conf Allows the build process to determine network information. Not required for this exercise as the corenetwork.te and corenetwork.if files have been built. booleans.subs_dist Common files installed for each policy type. Not required for this exercise. booleans-targeted.conf Replace the ./serefpolicy-3.12.1/policy/booleans.conf file with this version. securetty_types-targeted Replace the ./serefpolicy-3.12.1/config/appconfig-mcs/securetty_types file with this version. setrans-targeted.conf Not required for this exercise. users-targeted Replace the ./serefpolicy-3.12.1/policy/users file with this version. modules-targeted-base.conf Uses the targeted modules.conf. From rpmbuild/SOURCES/serefpolicy-3.12.1 run make install-src to install source at policy build location. Change to the /etc/selinux/targeted-179/src/policy directory where the policy has been installed. Note that if policy stores have been migrated, the store will default to /var/lib/selinux/targeted-179, with the modules in active/modules/400/<module_name>, there will also be a CIL version of the module (see [#4.1.1.Policy Store Migration|outline Policy Store Migration] for details). 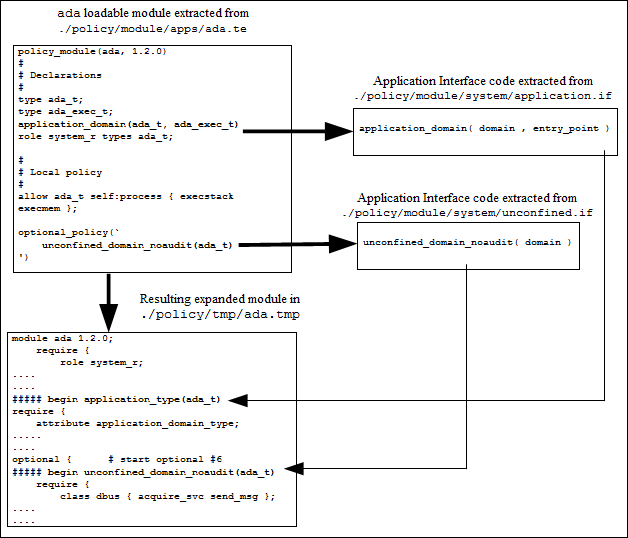 This method of building policy and adding new modules is used for distributions that do not require access to the source code. Note that the Reference Policy header and the Fedora policy header installations are slightly different as described below. Ensure the source is installed and configured as described in the Installing and Building the Reference Policy Source section. This is because the make load (or make install) command will package all the modules as defined in the modules.conf file, producing a base.pp and the relevant .pp packages. The build process will then install these in the /usr/share/selinux/<NAME> directory. Produce a build.conf file that represents the contents of the master build.conf file and place it in the /usr/share/selinux/<NAME>/include directory. Produce the XML documentation set that reflects the source and place it in the /usr/share/selinux/<NAME>/include directory. Copy a development Makefile for building from policy headers to the /usr/share/selinux/<NAME>/include directory. Copy the support macros .spt files to the /usr/share/selinux/<NAME>/include/support directory. This will also include an all_perms.spt file that will contain macros to allow all classes and permissions to be resolved. Note that this section describes the standard Reference Policy headers, the F-20 installation is slightly different and described in the Using Fedora Supplied Headers section. Once the headers are installed as defined above, new modules can be built in any local directory. An example set of module files are located in the reference policy source at /etc/selinux/<NAME>/src/policy/doc and are called example.te, example.if, and example.fc. Table 8 shows the make targets for modules built from headers. MODULENAME.pp Compile and package the MODULENAME local module. all Compile and package the modules in the current directory. load Compile and package the modules in the current directory, then insert them into the module store. refresh Attempts to reinsert all modules that are currently in the module store from the local and system module packages. xml Build a policy.xml from the XML included with the base policy headers and any XML in the modules in the current directory. A modules-base.lst and modules-contrib.lst containing a list of installed modules under /usr/share/selinux/<NAME>. The development header files are installed in the /usr/share/selinux/devel directory. The example modules are also in this directory and the Makefile is also slightly different to that used by the Reference Policy source. 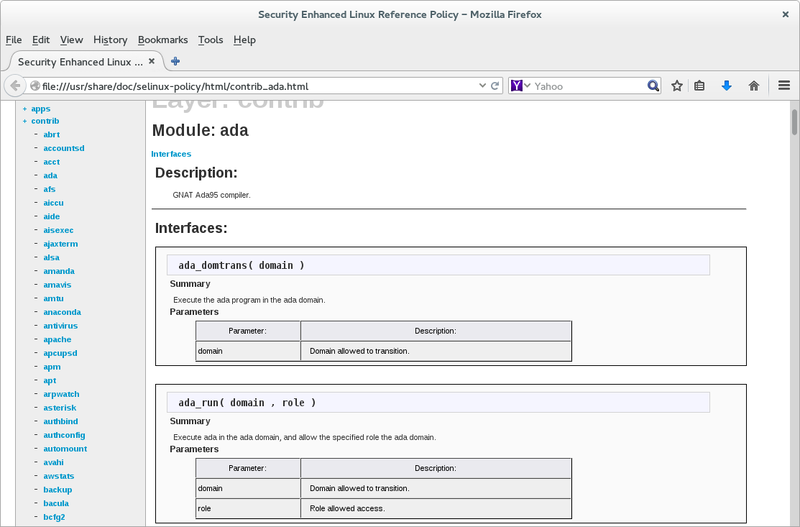 The documentation is installed in the /usr/share/doc/selinux-policy/html directory. As explained in the Policy Store Migration section, when libsepol etc. are upgraded to version 2.4, the policy stores will be migrated to the new location that will contain also contain CIL versions of the policy modules. ./policy/support for the reference policy source. /usr/share/selinux/<NAME>/include/support for Reference Policy installed header files. /usr/share/selinux/devel/support for Fedora installed header files. loadable_module.spt - Loadable module support. misc_macros.spt - Generate users, bools and security contexts. mls_mcs_macros.spt - MLS / MCS support. file_patterns.spt - Sets up allow rules via parameters for files and directories. ipc_patterns.spt - Sets up allow rules via parameters for Unix domain sockets. misc_patterns.spt - Domain and process transitions. obj_perm_sets.spt - Object classes and permissions. When the header files are installed the all_perms.spt support macro file is also installed that describes all classes and permissions configured in the original source policy. gen_sens Declares sensitivities s0 to s(N-1) with dominance in increasing numeric order with s0 lowest, s(N-1) highest. The macro calls can be in any configuration file read by the build process and can be found in (for example) the users, mls, mcs and constraints files. enable_mcs - this is used to test if the MCS policy is being built. enable_mls - this is used to test if the MLS policy is being built. enable_ubac - this enables the user based access control within the constraints file. hide_broken_symptoms - this is used to hide errors in modules with dontaudit rules. These are also mentioned in Table 20 as they are set by the initial build process with examples shown in the ifdef / ifndef Parameters section. The macro examples in this section have been taken from the reference policy module files and shown in each relevant "Example Macro" section. The macros are then expanded by the build process to form modules containing the policy language statements and rules in the tmp directory. These files have been extracted and modified for readability, then shown in each relevant "Expanded Macro" section. An example policy that has had macros expanded is shown in the Module Expansion Process section. The loadable policy module support macros are located in the loadable_module.spt file. This macro will add the module statement to a loadable module, and automatically add a require statement with pre-defined information for all loadable modules such as the system_r role, kernel classes and permissions, and optionally MCS / MLS information (sensitivity and category statements). policy_module The policy_module macro keyword. module_name The module identifier that must be unique in the module layers. version_number The module version number in M.m.m format (where M = major version number and m = minor version numbers). For use within module files to insert a require block. gen_require The gen_require macro keyword. require_statements These statements consist of those allowed in the policy language require statement. For use within module files to insert an optional block that will be expanded by the build process only if the modules containing the access or template interface calls that follow are present. If one module is present and the other is not, then the optional statements are not included (need to check). optional_policy The optional_policy macro keyword. optional_statements These statements consist of those allowed in the policy language optional statement. However they can also be interface template, or support macro calls. # shows the optional_policy macro with two levels. # the policy language statements with both optional levels expanded. # domain_auto_trans are not needed? This macro defines booleans that are global in scope. The corresponding tunable_policy macro contains the supporting statements allowed or not depending on the value of the boolean. These entries are extracted as a part of the build process (by the make conf target) and added to the global_tunables file where they can then be used to alter the default values for the make load or make install targets. Note that the comments shown in the example MUST be present as they are used to describe the function and are extracted for the documentation. gen_tunable The gen_tunable macro keyword. boolean_value The boolean value that can be either true or false. ## for public file transfer services. This macro contains the statements allowed or not depending on the value of the boolean defined by the gen_tunable macro. tunable_policy The tunable_policy macro keyword. gen_tunable_id This is the boolean identifier defined by the gen_tunable macro. It is possible to have multiple entries separated by && or as shown in the example. tunable_policy_rules These are the policy rules and statements as defined in the if statement policy language section. # showing the use of the boolean with the && operator. # This is the expanded macro from the tmp/ftp.tmp file. Access interface macros are defined in the interface module file (.if) and form the interface through which other modules can call on the modules services (as described in the Module Expansion section. interface The interface macro keyword. name The interface identifier that should be named to reflect the module identifier and its purpose. interface_rules This can consist of the support macros, policy language statements or other interface calls as required to provide the service. # showing the 'ftp_read_config' interface. # if they are called by a module that requires their services. # below with the expanded code shown afterwards. A template interface is used to help create a domain and set up the appropriate rules and statements to run an application / process. The basic idea is to set up an application in a domain that is suitable for the defined SELinux user and role to access but not others. Should a different user / role need to access the same application, another domain would be allocated (these are known as 'derived domains' as the domain name is derived from caller information). The application template shown in the example below is for openoffice.org where the domain being set up to run the application is based on the SELinux user xguest (parameter $1) therefore a domain type is initialised called xguest_openoffice_t, this is then added to the user domain attribute xguest_usertype (parameter $2). Finally the role xguest_r (parameter $3) is allowed access to the domain type xguest_openoffice_t. If a different user / role required access to openoffice.org, then by passing different parameters (i.e. user_u), a different domain would be set up. An access interface is called by other modules to perform a service. A template interface allows an application to be run in a domain based on user / role information to isolate different instances. template The template macro keyword. name The template identifier that should be named to reflect the module identifier and its purpose. By convention the last component is _template (e.g. ftp_per_role_template). template_rules This can consist of the support macros, policy language statements or interface calls as required to provide the service. # showing the 'openoffice_per_role_template' template interface. ##The per role template for the openoffice module. ##is the prefix for user_t). ##The type of the user domain. ##The role associated with the user domain. # module and extracted from tmp/xguest.tmp. # This is a long set of rules, therefore has been cut down. These macros are in the misc_macros.spt file. This macro is used to generate a valid security context and can be used in any of the module files. Its most general use is in the .fc file where it is used to set the files security context. gen_context The gen_context macro keyword. context The security context to be generated. This can include macros that are relevant to a context as shown in the example below. mcs MLS or MCS labels if enabled in the policy. This macro is used to generate a valid user statement and add an entry in the users_extra configuration file if it exists. gen_user The gen_user macro keyword. username The SELinux user id. prefix SELinux users without the prefix will not be in the users_extra file. This is added to user directories by the genhomedircon as discussed in the modules/active/file_contexts.template file section. mls_defaultlevel The default level if MLS / MCS policy. mls_range The range if MLS / MCS policy. mcs_categories The categories if MLS / MCS policy. # the users_extra file as shown below. Declare the boolean in the global_booleans file. Use the boolean in the module files with an if / else statement as shown in the example. gen_bool The gen_bool macro keyword. default_value The value true or false. ## Disable transitions to insmod. # expansion by the build process of the modutils.te module. These macros are in the mls_mcs_macros.spt file. This macro will generate a category statement for each category defined. These are then used in the base.conf / policy.conf source file and also inserted into each module by the policy_module Macro. The policy/policy/mcs and mls configuration files are the only files that contain this macro in the current reference policy. gen_cats The gen_cats macro keyword. These are the maximum number of categories that have been extracted from the build.conf file MCS_CATS or MLS_CATS entries and set as m4 parameters. # This example is from the policy/policy/mls configuration file. # This example has been extracted from the base.conf source file. This macro will generate a sensitivity statement for each sensitivity defined. These are then used in the base.conf / policy.conf source file and also inserted into each module by the policy_module Macro. The policy/policy/mcs and mls configuration files are the only files that contain this macro in the current reference policy (note that the mcs file has gen_sens(1) as only one sensitivity is required). gen_sens The gen_sens macro keyword. mls_num_sens These are the maximum number of sensitivities that have been extracted from the build.conf file MLS_SENS entries and set as an m4 parameter. This macro will generate a level statement for each level defined. These are then used in the base.conf / policy.conf source file. The policy/policy/mcs and mls configuration files are the only files that contain this macro in the current reference policy. gen_levels The gen_levels macro keyword. mls_num_sens This is the parameter that defines the number of sensitivities to generate. The MCS policy is set to '1'. This is the parameter that defines the number of categories to generate. These macros define system high etc. as shown. This section contains examples of the common ifdef / ifndef parameters that can be used in module source files. This is used within modules as shown in the example. The parameter is set up by the Makefile at the start of the build process. # This example is from the modules/kernel/domain.te module. These are used within modules as shown in the example. The parameters are set up by the Makefile with information taken from the build.conf file at the start of the build process. # This example is from the modules/kernel/kernel.te module. # This example is from the modules/kernel/kernel.if module. This is used within the ./policy/constraints configuration file to set up various attributes to support user based access control (UBAC). These attributes are then used within the various modules that want to support UBAC. This support was added in version 2 of the Reference Policy. The parameter is set up by the Makefile with information taken from the build.conf file at the start of the build process (ubac = y | ubac = n). # This example is from the ./policy/constraints file. This is used within modules as shown in the example. The parameter is set up by the Makefile with information taken from the build.conf file at the start of the build process (if DIRECT_INITRC = y). # This example is from the modules/system/selinuxutil.te module. # This example is from the modules/system/userdomain.te module. The objective of this section is to show how the modules are expanded by the reference policy build process to form files that can then be compiled and then loaded into the policy store by using the make MODULENAME.pp target. The files shown are those produced by the build process using the ada policy modules from the Reference Policy source tree (ada.te, ada.if and ada.fc) that are shown in the Reference Policy Module Files section. The initial build process will build the source text files in the policy/tmp directory as ada.tmp and ada.mod.fc (that are basically build equivalent ada.conf and ada.fc formatted files). The basic steps are shown in the The make ada sequence of events diagram, and the resulting expanded code shown in the The expansion process diagram. ↑ These RPMs can be obtained from http://koji.fedoraproject.org. ↑ These can be installed by system administrators as required. The dynamic loading / unloading of policies as applications are loaded is not yet supported. ↑ The comments are also important as they form part of the documentation when it is generated by the make html target. ↑ These are explained in the Reference Policy Macros section. ↑ The base.conf gets built for modular policies and a policy.conf file gets built for a monolithic policy. This page was last modified on 25 September 2015, at 14:37. This page has been accessed 166,059 times.